I am not a political specialist and I am certainly not aware of all the details in South African politics, but it does grasp me: the South African politics. Today I read that The Netherlands is ranked number two in the World Press Freedom Index 2014. South Africa is not yet on that level, but was able to climb up to the 42nd place compared to 52nd place in 2013. Still, there is a lot to be done to reach more press freedom. 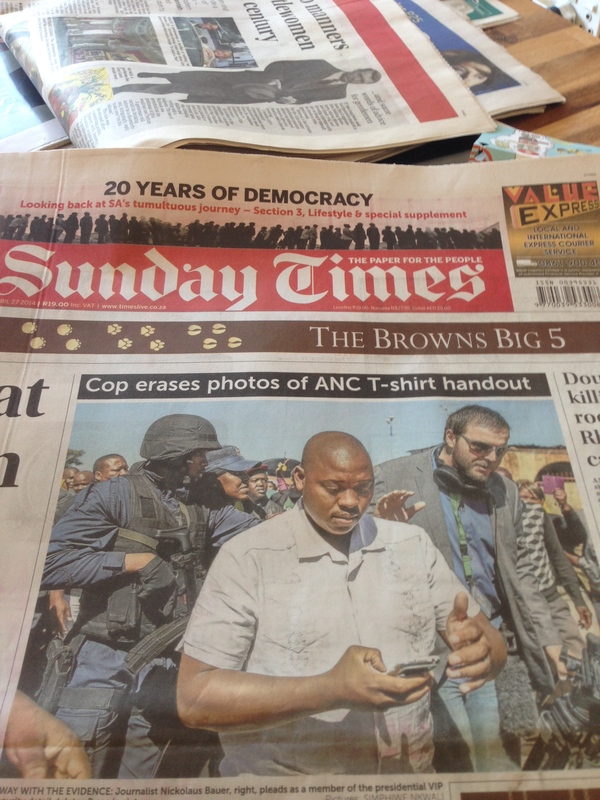 Last Sunday there was an article with picture on the front page of the Sunday Times, which showed a journalist whose phone was taken by an ANC official. During an ANC rally he noticed that a policeman was handing out t-shirts for the ANC and that his police car was stacked with those t-shirts. That is abuse of state resources and the journalist wanted to capture this on film. But obviously the ANC didn’t agree with this and erased the pictures after he took them, not being aware of all the other journalists which witnessed the process and could publish this event. Even though I am well aware of the amount of corruption taking place in this country, the story shocked me more than for example the corruption by current president Jacob Zuma. Zuma is charged for corruption for by the Public Protector of South Africa using 230 mln ZAR (€15,7 mln) for home improvements. Reason enough to be deposed in most democracies, Zuma is denying this allegation and seems to be getting away with it, again. Another thing which occupies my mind, is democracy and the right to vote, something that I find a privilege. On Sunday 27th of April, South Africa celebrated 20 years of democracy with the national holiday: Freedom Day. But sometimes it seems that some people are not appreciating democracy as much as they should be after the long fight. A lot of young people I have met these past few months, say they won’t go and vote. The answer to the question ‘why not?’ is that they don’t believe in de democratic system anymore. Some elder people actually state that they were better off during Apartheid, because at least they were taken care off. They also say that they will only go and vote when a white government is back in power because of the recent corruption scandals by the ANC government. To me, it painfully shows that Apartheid is still very much present in the thinking and acting of people and that the long walk to freedom is not over yet despite the good efforts the last 20 years.